Gelatinous transformation of bone marrow in a female F344/N rat from a subchronic study. The marrow is characterized by severe hypocellularity, atrophied fat cells, and the presence of eosinophilic granular ground substance. 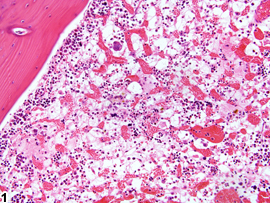 Higher magnification of gelatinous transformation of bone marrow in a female F344/N rat from a subchronic study. The marrow is characterized by severe hypocellularity, atrophied fat cells, and the presence of eosinophilic granular ground substance. 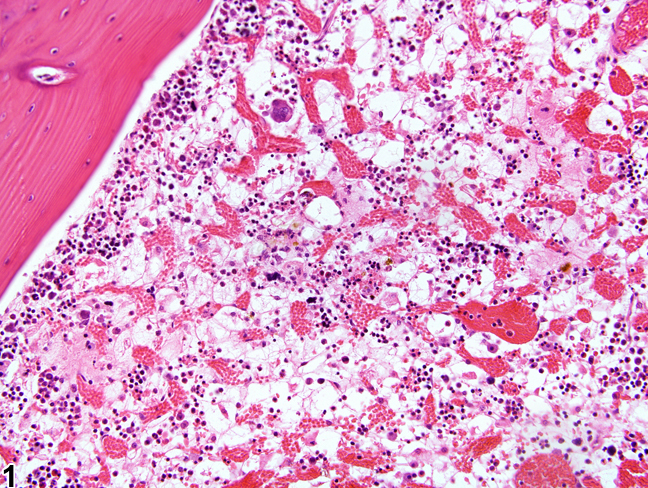 Gelatinous transformation of bone marrow (GMT), previously known as "serous atrophy of fat," is an uncommon condition in which there is a loss of adipocytes (fat atrophy) and hematopoietic cells, with replacement by an increased amount of extracellular ground substance ( Figure 1 , Figure 2 ,and Figure 3 ). This lesion is most often focal or multifocal. 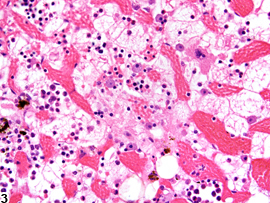 The ground substance is amorphous, light pink, and sometimes slightly granular in appearance and typically consists of acid mucopolysaccharides that stain positive with Alcian blue at pH 2.5 (humans, equids). To ensure Alcian blue positivity, specific tissue preparation and processing are necessary. GMT has been described in debilitated rodents and in general is associated with cachexia (e.g., secondary to neoplasia, endocrinopathies) and advanced severe malnutrition (e.g., maldigestion). Under current husbandry standards, however, GMT is rarely encountered in NTP studies today. Although the pathogenesis of GMT remains unclear, its association with a wide range of diseases suggests it may result from basic bioregulatory processes that are activated in states of advanced illness. 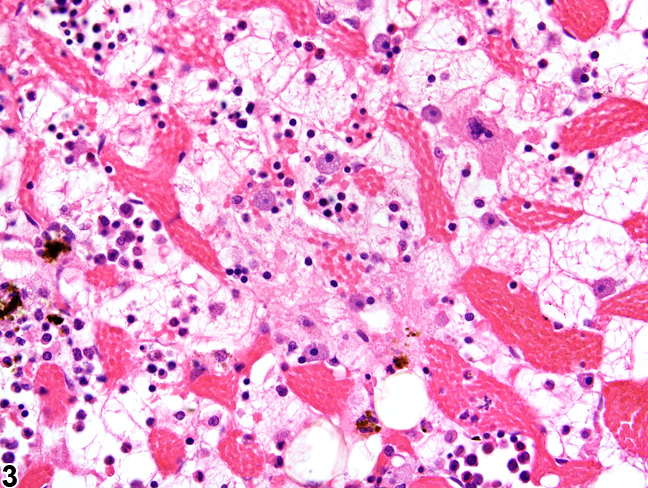 It has been suggested that the ground substance may be a replacement for the adipocytes that are used in catabolic states of disease, while the hematopoietic cell loss may be due to an unfavorable bone marrow microenvironment related to inadequate hematopoietic substrates and lack of stimulation by adipocytes and fibrocytes. Gelatinous transformation of bone marrow should always be recorded and graded. Severity grade is based on the extent of marrow affected. The older terms "serous degeneration," "bone marrow degeneration," "serous atrophy of fat," and "fat degeneration" should not be used to diagnose this finding. Bain BJ, Clark DM, Lampert IA, Wilkins BS. 2001. Bone Marrow Pathology, 3rd ed. Blackwell, Ames, IA, 90-140. Beeler-Marfisi J, Menoyo AG, Beck A, König J, Hewson J, Bienzle D. 2011. Gelatinous marrow transformation and hematopoietic atrophy in a miniature horse stallion. Vet Pathol 48:451-455. Böhm J. 2000. 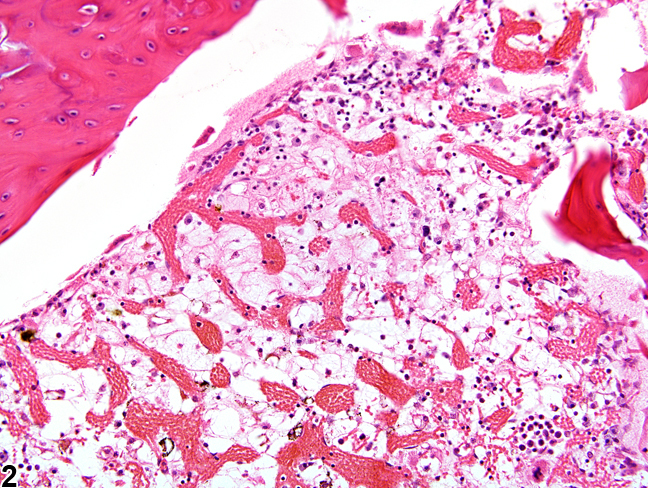 Gelatinous transformation of the bone marrow - the spectrum of underlying diseases. Am J Surg Pathol 24:56-65. Weiss DJ. 2010. Chronic inflammation and secondary myelofibrosis. In: Schalm’s Veterinary Hematology, 5th ed (Weiss DJ, Wardrop KJ, eds). Wiley-Blackwell, Ames, IA, 112-117.